Sweet Bananas may look like their hot counter-part but they are mild and sweet. Peppers are not only great tasting, but they are also very high in vitamin C. Being sensitive to the cold, planting should be delayed until the danger of frost is past in the spring. Ideal temperatures are 70 to 80 degrees F during the day, and 60 to 70 degrees F at night. Usually, the plants set satisfactory crops when temperatures are between 65 and 80 degrees F and the soil is well-supplied with moisture. Avoid a soggy, water-logged soil condition when growing peppers. Outstanding Features: Produces an abundance of peppers on one plant. 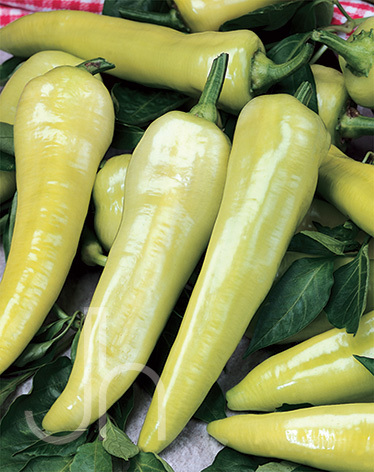 Click here to buy Sweet Banana Peppers direct from www.buygardenvegetables.com.